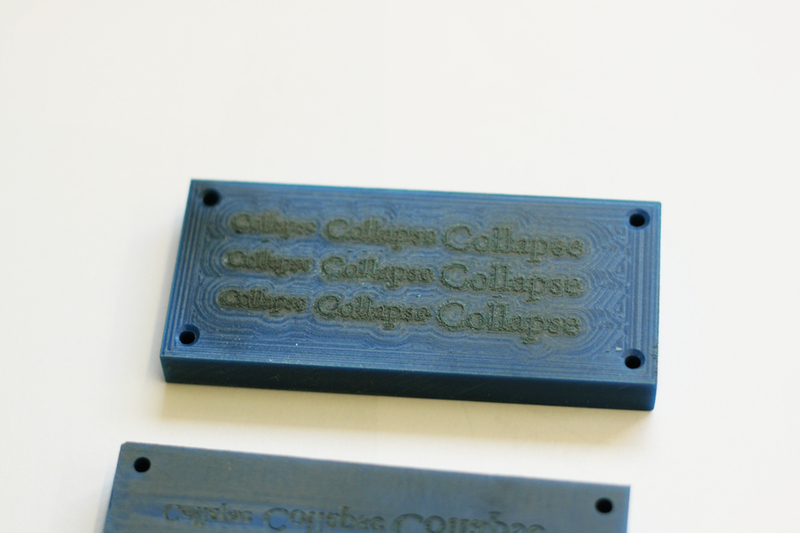 I was asked by Robin Mackay and Paul Chaney, who work in the workshop next door to me, whether I would be able to produce a set of embossing stamps for an upcoming issue of Robin’s philsophical journal, Collapse. I had never done this before, but I’m pretty interested in printing techniques, so jumped at the opportunity. 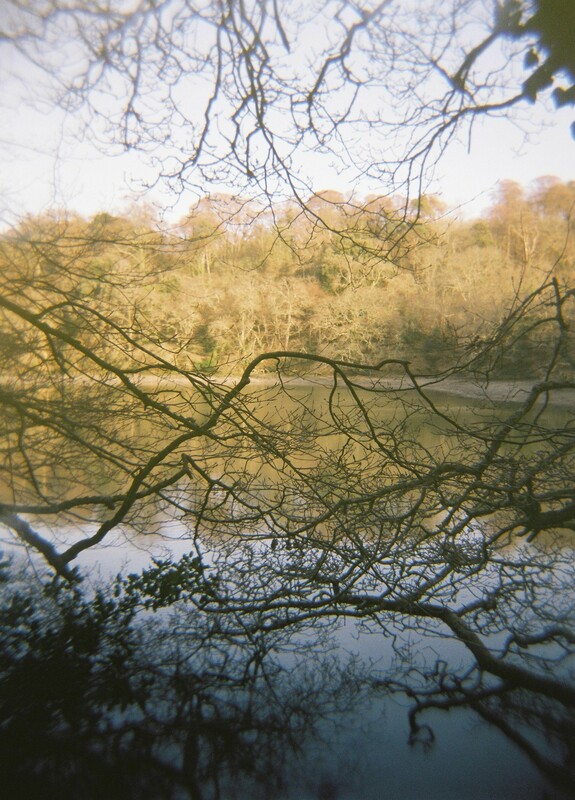 This next post kind of catalogues the stages I went through if anyone is interested in doing the same. 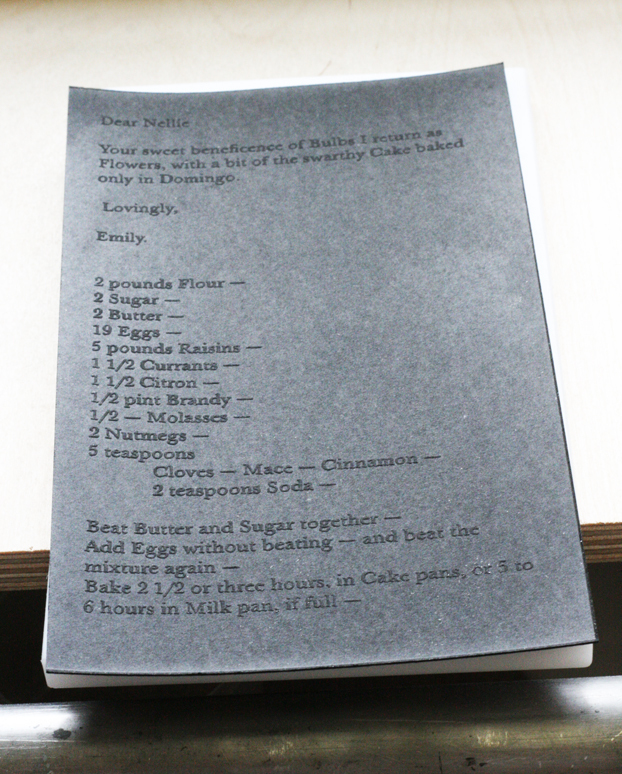 Robin wanted a sheet, almost A6 (100mm X 170mm), that contained the text of a recipe. Before I went about cutting this out, I wanted to do some smaller size experiemnts. I had heard that nylon is the best material for making the stamps, so using the little CNC mill, I cut out a male and female block from some blue Nylon we had. 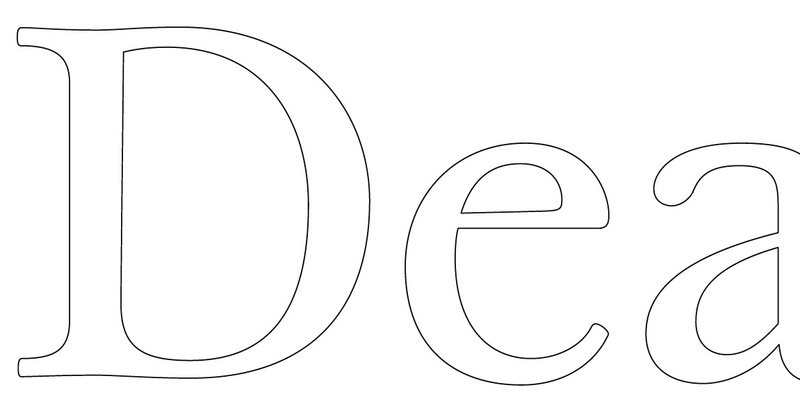 To start with I made the cut paths in Illustrator by outlining the text I had, then offsetting the outlined path. 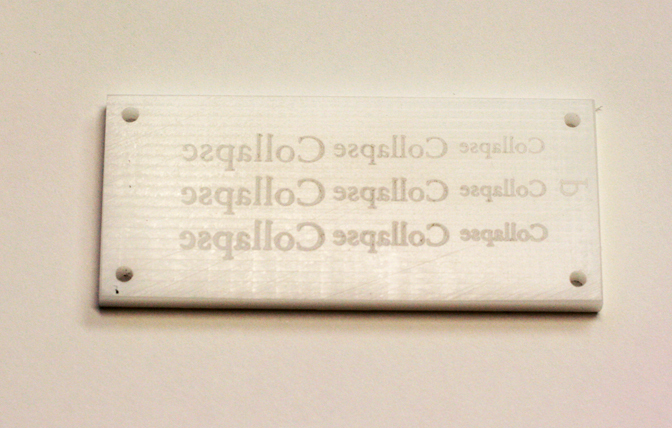 When making the female block, the offset needs to be inside the text to account for the angle of the engraving bit. The engraving bit I was using was 30 degrees from vertical, which meant that if I wanted to engrave 0.2mm deep, I had to offset by (0.2 * tan30)=0.115mm. I repeated this offset until the middle of the thickest part of the text was reached. Once this was done, the text needs to be flipped for the female. 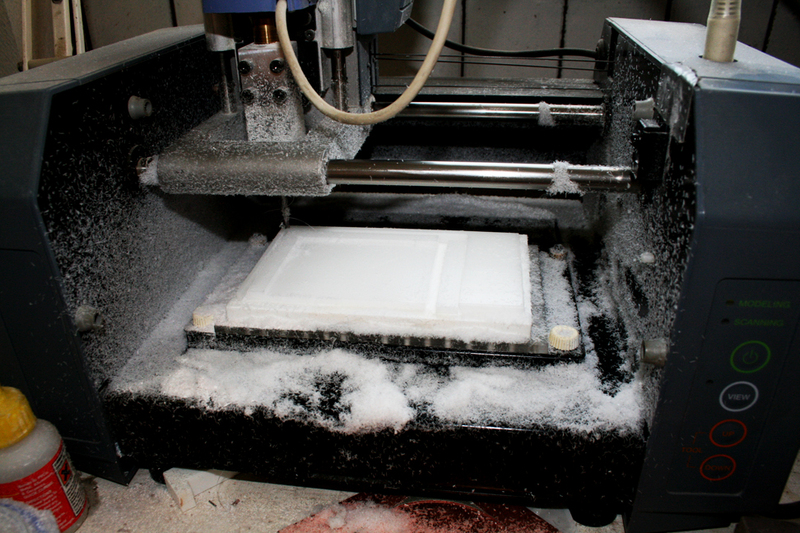 Here you can see it once it was milled out. I found that Nylon was less than ideal because of the amount of swarf that gets left attached to the block. 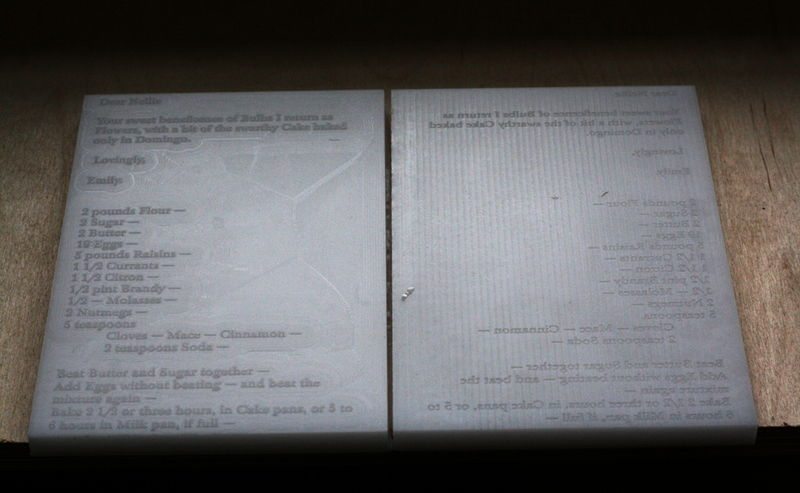 Here’s the male piece, where the cut path has been offset around the outside of the text. 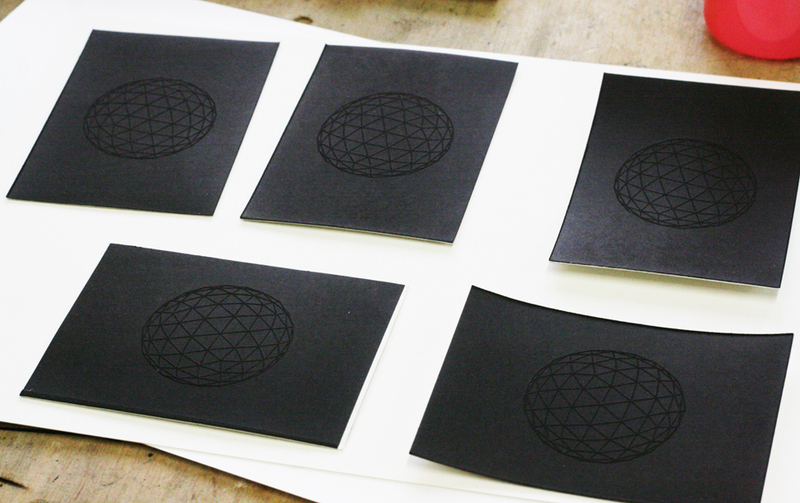 Here you can see the results of the first stamp test. 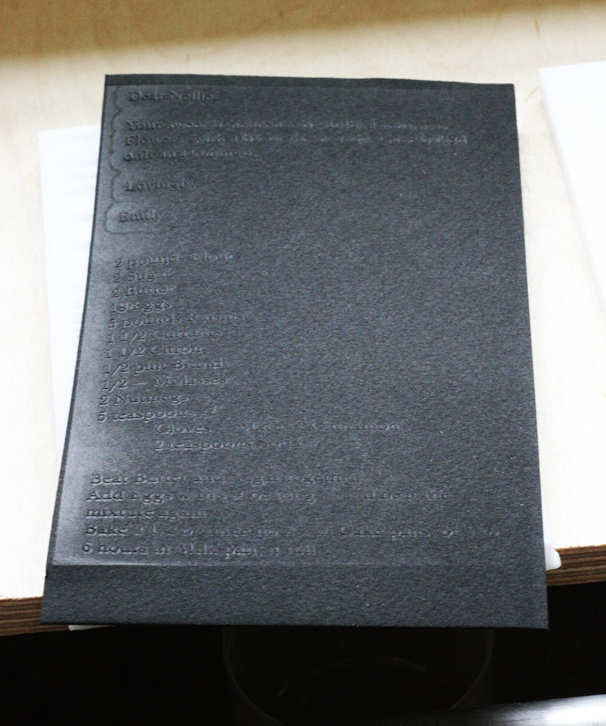 The final piece was to be on this thick matt black paper as it was part of the artwork. I then decided to use Acetal rather than Nylon, which macines a whole lot better. 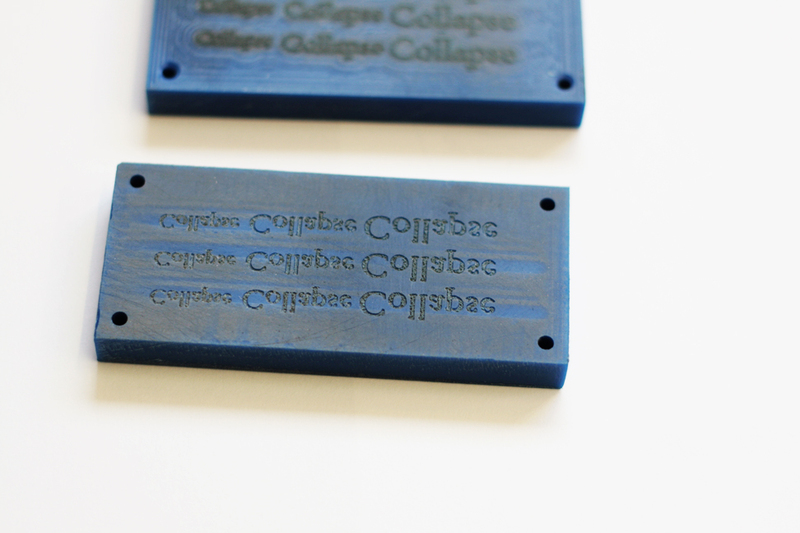 I made this test block, with varying engraving depths. Here the results using the different depths. As you can see, the shallowest engraving produced the most detailed emboss. To achieve this fine a detail, I had to trace over each letter in the font to create a special variation for engraving. Because if you just offset the path, where there are really thin bits of the letter, the path just dissappears. 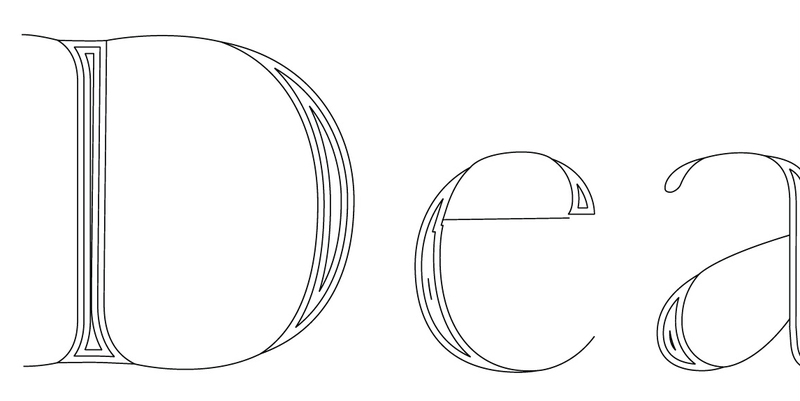 To get around this, I traced a line along the centre of each letter. Evil Mad Scientist made an Inkscape extension for doing this with a tutorial on how to use it here. I use Illustrator so I did it manually, which took a while, but I prefer most of the features that are with Illustrator. This shows the outline of the font itself. Here you can see the actual cut paths, created by ofsetting the outline. The plate sizes needed were slightly larger than the maximum size of the bed which is 152.3mm X 101.6mm, so I had to construct some jigs that I thought would hold both the male and female plates in the same position. Unfortunately I was unable to get the surface of the plate flat enough to get an even engraving. In the photo above, the upper right corner is engraved OK, but the bottom end hasn’t engraved at all. I thought I’d be able to get round the problem by machining a male and a female that were slightly smaller, to fit onto the machine bed so I could fully flatten them on the machine before cutting, and I managed to make to plates well enough, but the finished sheet had lines accros it that weren’t wanted. On this example, you can see that the press wasn’t even from left to right. Also you can see offset lines around the text, towards the top on the left, that is from imperfect cutting of the male piece of the stamp. On top of this, the stamps don’t fully reach the top and bottom of the paper, which had all been guillotined to that size. In the end it worked out OK. The reason that the original stamps weren’t flat on the cutting surface is because there was a jig in place so that both male and female plates were aligned, but this jig was pretty precarious. I realised that if I didn’t use the male stamp, I could just cut the female part flat on the macine bed. The press has enough pressure to flatten all the paper apart from the recesses engraved into it. This had the added benefit of making the text easier to read because the flattened part of the paper took on a much smoother, almost glossy surface, but the raised text was left with it’s original matt finish. This made the contrast much higher. 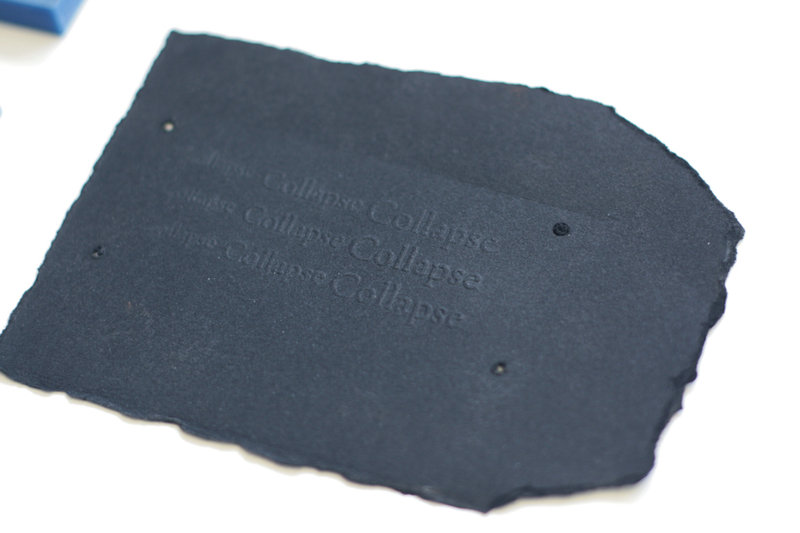 The text of the emboss is for a recipe for a pretty gluttonous cake that is a artist commision for the Collapse journal. Here is a picture of the press. It consists of 2 thick aluminium rollers, with the top free-rolling roller being height adjustable, and the bottom roller being connected to the handle. 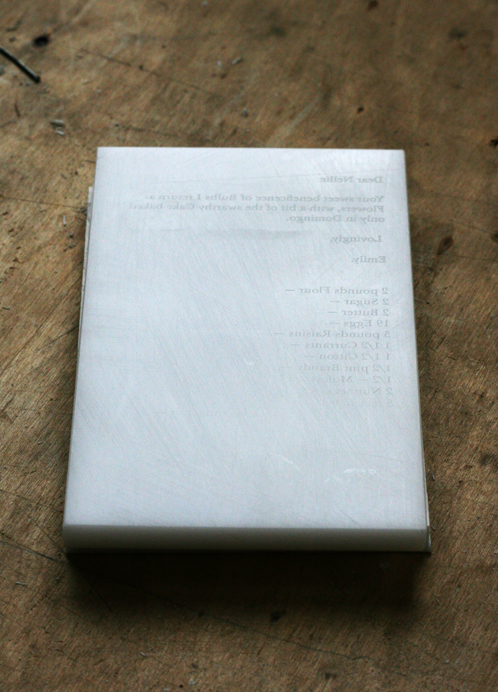 It is very beefy and sturdy and could easily handle the high pressures needed for the embossing. 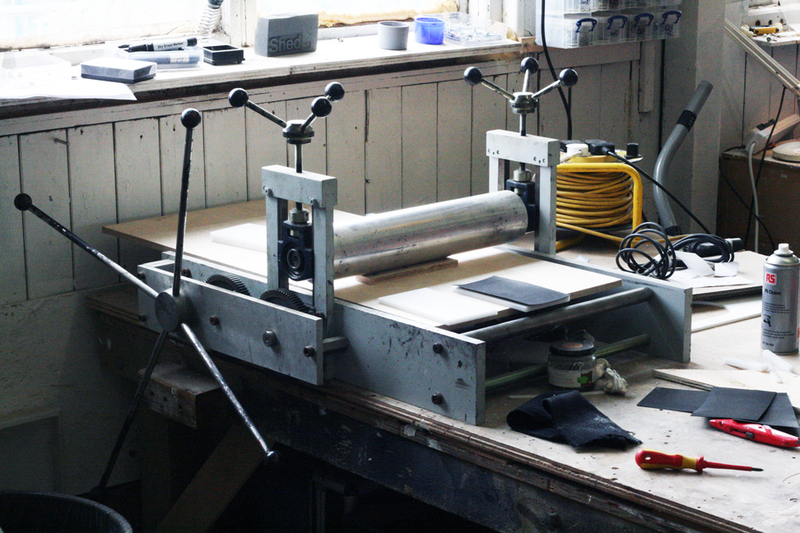 I thought it might be nice to use this press to emboss some business cards. 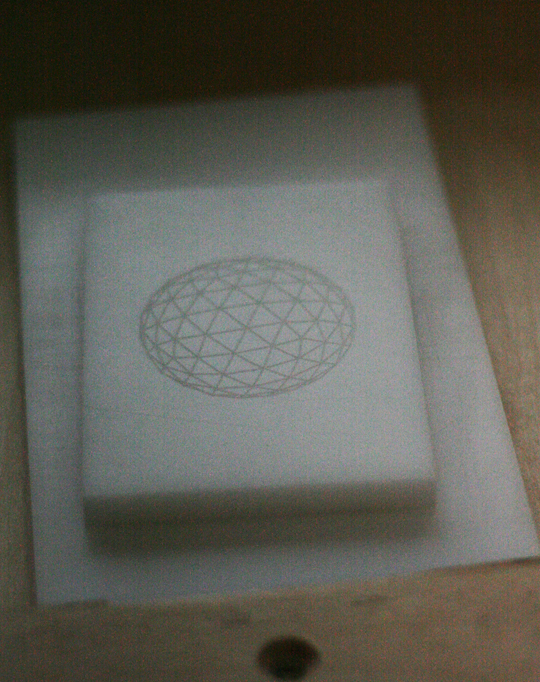 engraved a little block with a nice geodesic sphere pattern. I used the same black card used for the recipe, but when I ran them through the press, I spray glued an inkjet printed piece of white card that contained the details on. 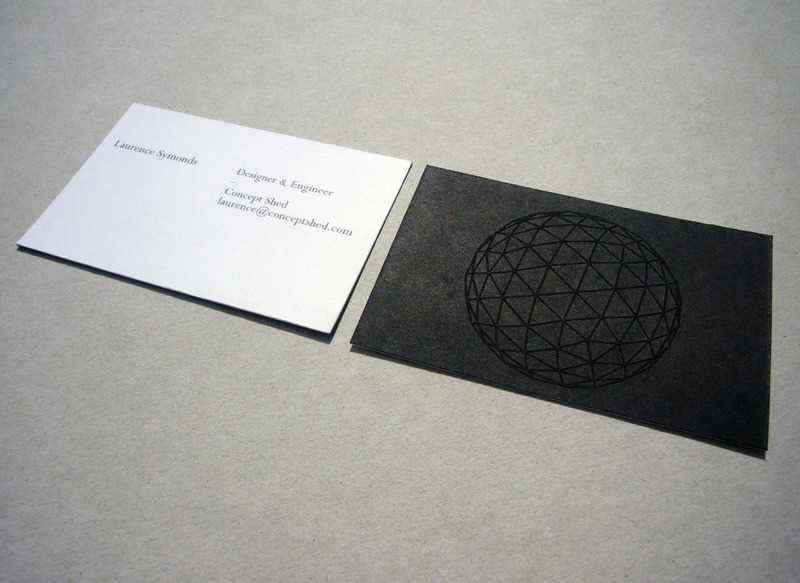 So the front of the card is a normal white business card and the back is this nice embossed geodesic pattern. Here you can see both sides of the card. Big thanks to Alan Clarke for helping with the graphics and also for the photo. So if anyone has an interest in trying to emboss their designs, I hope this might help. 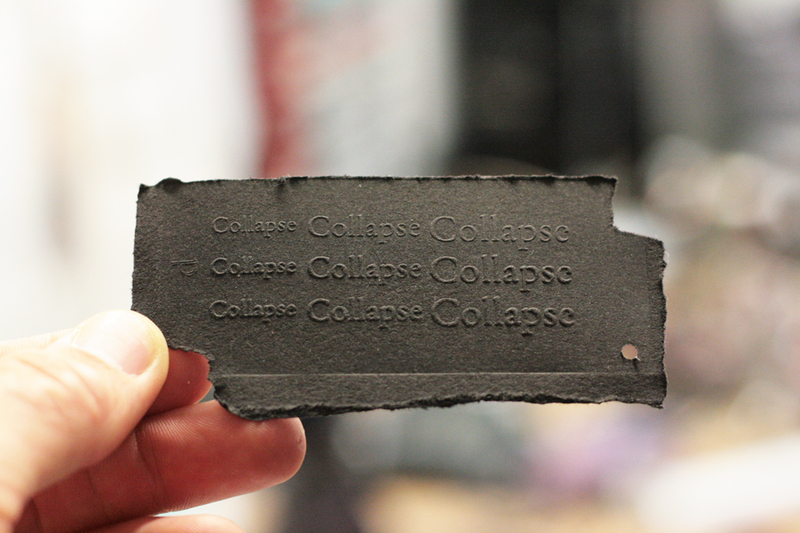 Using the female only stamp method is good in that it is simpler to create the stamp and improves the contrast between the embossed part and the pressed part, but if you want to keep a consistent texture of the paper, you’ll need to have a male part. I’d highly reccomend using a roller press like the one above, because it makes it quick and consistent. I did try some presses using a bench vice and G-clamps but it took much longer to do each pressing and they tended to be more patchy. If you’ve got any more questions, just contact me.